MANASSAS, VA--(Marketwire - August 5, 2008) - Aurora Flight Sciences engineer Adam Woodworth established a national record in an attempt at the Fédération Aéronautique Internationale (FAI) F5SOL endurance world record for a radio controlled solar powered model aircraft (no batteries onboard). The aircraft with a wingspan of 3.1m, weighs 1.35 kg, and was designed to maximize endurance with the smallest (i.e. cheapest) possible solar array. The aircraft flew for 7hrs 13min setting a new U.S. national endurance record. The world endurance record for this category of 11hrs 34 min was set in 1997 by Wolfgang Schaeper of Germany. Woodworth and his teammate Carl Engel are now in the process of ratifying the record with the Academy of Model Aeronautics (AMA). "I consider my career an outgrowth of this hobby. I've grown up around things that fly. My father introduced me to model airplanes and rocketry at a very young age, and I've had the aviation bug ever since. I've been designing/building/flying model aircraft since I was 6 years old, and I've never seriously considered a career path that didn't involve flight," said Woodworth. "We view this attempt as a major stepping stone to breaking the world record, and we will be making additional attempts at the endurance, distance, and altitude records in the future." Aurora Flight Sciences recruited Adam because of earlier work on this project while he was a junior at MIT. Woodworth's experience with this project puts him in a very small group of people who have actually flown an aircraft powered by the sun. The hobby has served him well; Woodworth is currently working as an aero-engineer on the Defense Advanced Research Projects Agency (DARPA) Vulture Program awarded to Aurora Flight Sciences in April. 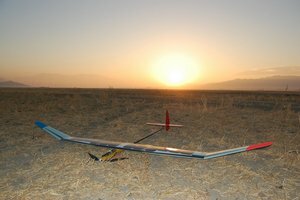 The goal of the Vulture program is to develop and demonstrate a radical new unmanned solar aircraft that can stay aloft for five years. Aurora Flight Sciences designs and builds robotic aircraft and other advanced aerospace vehicles for scientific and military applications. Aurora is headquartered in Manassas, VA and operates production plants in Clarksburg, WV and Columbus, MS and a Research and Development Center in Cambridge, MA. To view recent press releases and more about Aurora please visit our web site at www.aurora.aero.